PRE-production is underway on a six-part prequel to Starz’ hit original series Spartacus: Blood and Sand. 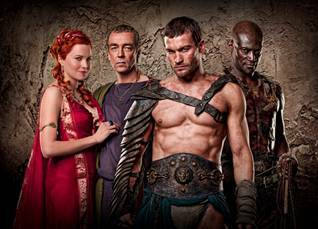 Andy Whitfield, who played the title character in the series, will appear briefly in the prequel, but Lucy Lawless and John Hannah take center stage in this story of the rise of the House of Batiatus and its champions before Spartacus arrives as a captured Thracian slave. With the title still to be determined, the prequel will begin production this summer in New Zealand and is slated to air on Starz in January 2011. John Hannah returns as Batiatus, owner of the Ludus, along with his wife Lucretia, played by Lucy Lawless. Other returning actors include Peter Mensah (Doctore), Manu Bennett (Crixus), Antonio Te Maioha (Barca), Nick E. Tarabay (Ashur), Lesley-Ann Brandt (Naevia) – and others. New characters will also be added – most notably the gladiator who was champion of the House of Batiatus before Spartacus or even Crixus – who will help fill in the story about the people and politics in the House of Batiatus and ancient Capua as a whole. Production on the second season of Spartacus: Blood and Sand was postponed this spring to allow Andy Whitfield to be treated for Non-Hodgkin Lymphoma in New Zealand. His doctors indicate that the actor is responding well. As noted above, photo is copyright of Starz, so please no unauthorized copying or duplicating of any kind. Thanks!